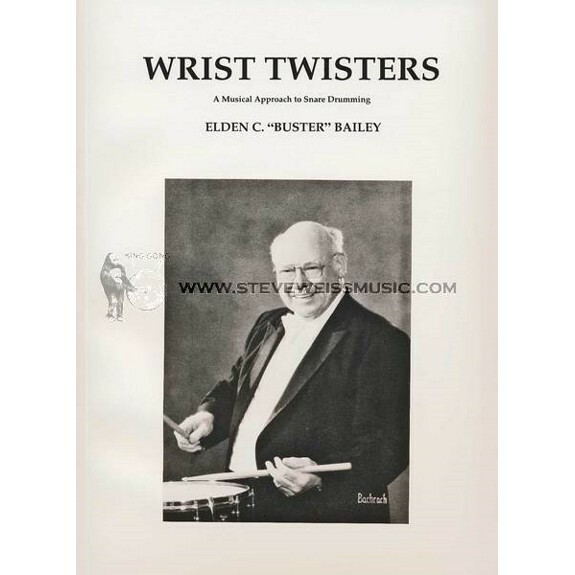 After 40 years with the New York Philharmonic and more than twenty years teaching at the Juilliard School, Elden "Buster" Bailey, one of the greatest snare drummers and snare drum teachers of all time, has finally written a snare drum book! It's called Wrist Twisters, but it's much more than what the title might suggest. Everyone who has seen it says it is an instant classic. It includes a CD of Buster's playing and a discography of great snare drum performances with the New York Philharmonic. Scott Stevens of the Metropolitan Opera Orchestra worked with Buster for more than three years to compile and organize the materials Buster has been gathering for the last forty years. Percussionists everywhere will be forever grateful to Buster and Scott for their efforts. The Introduction is by Christopher Lamb of the New York Philharmonic and Manhattan School of Music. Need we say more? 132 pages plus CD. Good book - lots of exercises. These are not easy. He wants them played smoothly and with flow. Something we may not pay much heed to necessarily. Good explanations on how to get clean flowing rolls and buzz rolls. The only negative to this book is that it covers primarily singles, doubles, rolls , drags and flams. No mention of the other rudiments - although any of the other rudiments would be comprised of what is covered. I would highly recommend this book to anyone looking to improve their playing ability, or refine their existing ability. The text at the beginning alone is worth the price of the book, and the exercises will improve your technical and musical facility in every possible way. I was a student of Buster's back in the 1970's that picture on the cover is just how I remember him. The exercises in the book are also how I remember our weekly warm ups on snare drum. He had a rare talent and it is hard to convey to people why he played the way he did. This is an amazing book that will challenge you and will make you a better player. The stickings and dynamics are more advanced as you progress through this book. I studied with Buster years before he wrote this book and he made me a much better snare player. Best book there is on learning to use your hands! It has always amazed me that this book isn't the ONLY snare drum technique book in existence, because it's SO much better than any other book out there (no offense to authors of other books). In fact, if I had to guess why this book isn't more widely-known, it's because the techniques Buster taught (and the exercises in this book---which those of us who were lucky enough to study with Buster called "Bustercises") are extraordinarily difficult to play relaxed and smoothly at any dynamic level. Most drummers would probably give up in frustration. But if you really read Buster's approach to technique...and really stick with these exercises, it will revolutionize your playing. Everyone who studied with Buster at Juilliard basically had their playing broken down to nothing, then rebuilt from the ground up using the techniques in this book. We might have thought we were pretty good when we arrived at Juilliard, but a few lessons with Buster soon cleared us of that false belief, LOL.